1Cook noodles according to package directions, omitting salt. Reserve 1/2 cup cooking water; drain remaining water. Return noodles to pot and set aside. 2Meanwhile, heat 1 tablespoon oil in large skillet over medium-high heat. Sprinkle chicken with 1/4 teaspoon garlic salt and pepper. Add to skillet; cook 5 to 7 minutes or until no longer pink in centers, stirring occasionally. Remove from skillet; set aside. 3Heat remaining 1 tablespoon oil in same skillet. Add asparagus; cook 2 minutes or until crisp-tender, stirring frequently. Add squash and remaining 1/2 teaspoon garlic salt; cook 3 minutes more, stirring frequently. 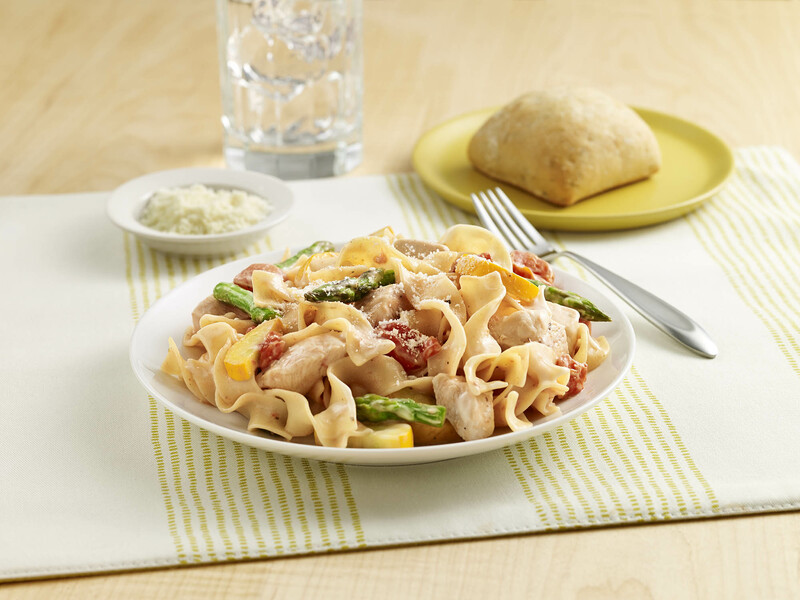 4Add vegetable mixture, cooked chicken, drained tomatoes, Alfredo sauce and reserved water to noodles; toss to coat. Heat 2 minutes more or until hot. Top with cheese, if desired.